Home Companies TOBO GROUP(SHANGHAI)CO., LTD.
Titanium 6-2-4-2 has excellent strength, stability, and creep resistance to temperatures as high as 550 °C. Titanium 6Al-6V-2Sn is a two-phase, Alpha Beta Alloy. It is usually used in the annealed or solution treated and aged conditions. It’s a heat treatable, high strength alloy with lower toughness and ductility than Titanium Grade 5 (6Al-4V) and it’s difficult to weld. Cold forming of Titanium 6Al-6V-2Sn is difficult because of its high strength and the large amount of spring-back that results. This grade can be welded by the inert gas shielded, fusion welding process but the heat effected area will have less ductility and toughness than the parent material. The hardness of Titanium 6-6-2 is approximately Rockwell C 36-38. This grade is primarily used for airframe and jet engine parts, rocket engine cases and ordinance components. Please call us to determine our minimum item quantity. Titanium 6Al-2Sn-4Zr-6Mo is an Alpha-Beta Alloy and it’s generally regarded as the workhorse alloy of the titanium industry. The alloy is fully heat-treatable in section sizes up to one inch and is used up to approximately 400°C (750°F). Since it is one of the most commonly used alloys (over 70% of all alloy grades melted are a sub-grade of Ti-6-4,) its uses span many aerospace engine and airframe components. Titanium 6Al-2Sn-4Zr-6Mo is also used in lots of non-aerospace applications such as marine, offshore and power generation industries. This Alpha-Beta Alloy combines good corrosion resistance and strength with weldability and fabricability. 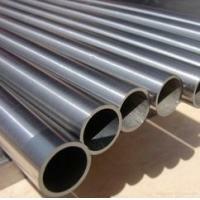 The alloy is generally available in bar form and it’s typically used in deep sour well applications. This alloy can be hot or cold formed. Please call us to determine our minimum item quantity. Titanium 8Al-1Mo-1V is a near Alpha Alloy that was primarily designed for use at elevated temperatures - up to 455 degrees centigrade. It offers the highest modulus and lowest density of all Titanium alloys. It has good creep strength and it’s weldable by the inert gas fusion and resistance-welding processes. Titanium 8Al-1Mo-1V is used in the annealed condition for such applications as airframe and jet engine parts that demand high strength, superior creep resistance and a good stiffness-to-density ratio. The machinability of this grade is similar to that of Titanium 6Al-4V. Please call us to determine our minimum item quantity. Titanium 10V-2Fe-3Al is a Titanium Beta Alloy. It is harder and stronger than many titanium alloys. This Titanium is a heat treatable alloy, it’s weldable and it’s easily formed. Titanium 10V-2Fe-3Al is an all Beta Alloy and is more difficult to machine than most titanium alloys. The chief problems include flank wear, spring-back and chip control. Because of these characteristics, positive rake chip grooves in combination with light hones on the cutting edge are advantageous. Please call us to determine our minimum item quantity. This Metastable-Beta Alloy is used primarily in sheet metal form. It is age-hardenable and highly cold-formable. Titanium 15V-3-3-3 is often used to replace hot-formed Titanium Grade 5 (6Al-4V) sheet. It can also be produced as foil and is an excellent alloy for castings. For aerospace applications, this grade is often specified as AMS 4914. Please call to determine the minimum item quantity. Commercially pure titanium and alpha alloys of titanium are non-heat treatable and have very good welding characteristics. The Metastable Titanium Beta Alloys are heat treatable by solution treatment and ageing. Fully stable beta alloys can only be annealed. The most commonly used Titanium Alpha Beta Alloy is Ti 6Al-4V. Titanium 6Al-4V has been developed in many variations of the basic formulation for numerous and widely differing applications. Commercially Pure Titanium Grade 4 is stronger than CP Grades 2 & 3 - it can be cold formed, but has lower ductility. It has excellent corrosion resistance in a wide variety of environments. Grade 4 titanium is commonly used in Aerospace, Industrial and Medical applications where high strength is needed.